Tangle (DAG) for some is a just a buzzword, while for others, it has become the best way of crypto financing or may be, a way of living. There are a number of different cryptocurrencies flourishing in the market such as Bitcoin, Ethereum, ETH, NEM, Ripple, IOTA and Litecoin etc. 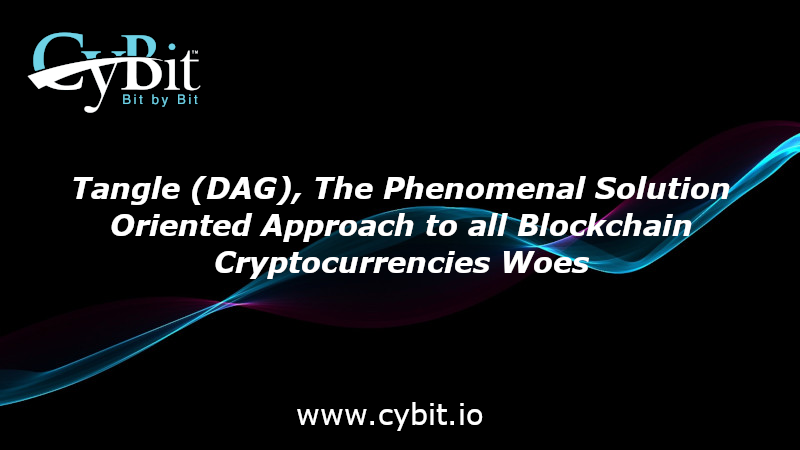 All these cryptocurrencies have multi-billion dollar worth in the financial market but still, there are some technology related shortcomings Let us first look at the evolution of Tangle (DAG), what it is actually and how it has become, what it is today. DAG in Tangle stands for Directed Acyclic Graph. So, it is a kind of a directed graph type which employs such data structure which brings into use the topological ordering as well. The system is designed in such a way that the sequence could only possibly move from the earlier to the later point and not otherwise. Briefly, it has application where there are issues related to the processing of data, looking for the optimized navigation path, scheduling and data compression. In order to understand the evolution of Tangle (DAG), we need to connect dots back in the year 2015, when the blockchain was the standalone ruling technology. Before this enormous popularity of blockchain was achieved, it was just known as a conventional data structure that is using the Bitcoin technology. So, the transition from just being an ordinary technology to a popular one helped it gain the title of Blockchain 1.0, the pioneer and the first of its kind. That was the time when Ethereum based model (also used by CyBitTM) was creating great waves in the crypto circle as a much loved decentralized platform which was preferred for running just as it is programmed. Soon, with time, Ethereum model became to be known as the Blockchain 2.0. This is the time when there are many speculations about what would become the Blockchain 3.0. This could probably be the Directed Acyclic Graph (DAG) for a number of its good characteristics which might not be possessed by all of its predecessors or other related technologies. Bitcoin is the pioneer in the decentralized digital currency, where their worldwide payment system is made to work without having any central authority, single administrator or a central bank. Unlike the fiat currencies, Bitcoin has got limited supply which is tightly scrutinized by the underlying algortithm.it is an open source platform whose code is readily available over the web in order to be manipulated by the project developers as per their needs in the projects. · It comes with a minimal transaction cost. · The digital nature provides immense protection against possible payment fraud. · Bitcoin just on its own made over $8 billion in transactions as compared to a total of $132 million done altogether by Fedwire, Bank of America, Western Union, PayPal and Automated Clearing House (ACH). · Ensures direct transfer and eliminates any need for third party approval for payments. · The technology protects your identity and other information over the public network. · Transactions carried through Bitcoin blockchain network are irreversible. It means if you make a transaction accidentally then your funds are lost forever. · Bitcoin has scalability issues as a block size limit of 1MB is still imposed. · By nature, the Bitcoin network could be used for illicit funding and immoral activities. · Centralization — We have seen earlier that small miners makes large groups for the sake of lessening the reward’s variation. This situation propels into the concentration of power going into the control of a handful of operators. It enables them to implement policies of wide spectrum, including postposing and filtering policies over a certain range of transactions. Although, no reporting of such incidents anytime in the past with the misuse of power but certainly there was the presence of such an opportunity. This is what Tangle is. Bitcoin, on the other hand is known for somewhat having a centralized control. Just imagine that there are 10 mining pools which accounts for 80 percent of the mined blocks over the past week and all exist Japan. This is an issue as just imagine a regulation change in Japan resulting in a large chunk Bitcoin hardware getting totally isolated from the other parts of the world. · Cryptography — Tangle technology make use of the quantum resistant algorithms for cryptography which are immune to any kind of the brute force attack. Moreover, Tangle also diminishes any chances of having a Quantum consensus attack impact by a million times. This on the other side is an issue with Bitcoin, as that could be crippled with an instantaneous Quantum computers large scale deployment. · Micropayments — Bitcoin in its initial days had very low transaction fees and was the unique selling point of Bitcoin at that time. But, with time, the transaction fees went quite high. Tangle, has no transaction fees, whatsoever. You may send a token worth a fraction of dollar with no payment of any transaction fees. · Partition — Bitcoin requires transactions to be fully relayed by the nodes that are hooked up with the network. There is no possibility of carrying out any transactions in an off-chain manner as the ledger update is constantly required in order to restrict ant double spends cases. The Tangle may operate without the need to be hooked up with the main Tangle. You may do so with the connection with ease and whenever you want. Ethereum is one of the finest and innovative open source blockchain technology offering distributed computer network. Ethereum by nature is very much similar to the Bitcoin technology discussed above but, there are some notable technology-based differences between the two. Their major difference is in their capability and purpose. With an Ethereum blockchain as the one entrusted by CyBitTM, the miners work for earning Ether, which is a particular type of a crypto token required for fueling the network, instead of mining bitcoin. Ether more so is also employed by the developers of the platform to pay the required transaction fees and for any of the services on the Ethereum network. · In an Ethereum network, no third party could ever make any possible change to the data. · The Ethereum platform is totally corruption free as it is almost impossible to make any kind of censorship. · Any app that is connected to Ethereum would hardly ever go down and this could never be shut down as well. · Ethereum can largely be trusted for the fundraising campaigns by making use of the smart contracts. · Ethereum, for mining the Ether tokens just takes about 14seconds, which is quick as compared to the bitcoin, that takes somewhere over 4 hours. · The algorithm that the network uses for mining Ether tokens is known as “Proof of Work” and this is smart enough to restrict any kind of hacker attacks. · The smart contracts are programmed manually so there is an element of possible human error which could lead to code bugs and result in unintended actions to be taken. · If there is any possible attack or exploitation in the network then only possible way to stop this is to rewrite the underlying code and go for a network consensus prior to that. · Mining — Ethereum is totally dependent upon the miners to work for validating the carried transactions. Tangle on the other hand does not need miners to validate any transaction. Actually, every transacting device over the network of Tangle is required for validating transactions. · Speed — The transaction speed of Tangle is about double to that of the Ethereum. In actual comparison, Ethereum takes about 6 minutes for completing its transaction while Tangle takes just about 3 minutes for doing the same job. · Transaction Speed — As Tangle by nature has no miners at all in its network, so for carrying out any transactions, no transaction fees is required to be paid. On the flipside, Ethereum does require a transaction fee to be paid in order to complete it. · Efficiency — Tangle is far more efficient than the Ethereum as lack of mining means that not much energy is required for running the Tangle network. Ternary logic in place of the binary logic also makes Tangle network more efficient. Ethereum is still known for relying on mining and for this reason, it consumes a lot of energy. · Open Source — Ethereum enjoys a completely open source platform, in contrast to the closed-nature platform of Tangle, which is highly criticized for such a structure. · Inflation — IOTA, one of the application of Tangle is known to have all its tokens being already issues. On the other end, the supply for Ethereum would always be increasing. This scenario in other word means that Ethereum has a risk for inflation and Tangle doesn’t. NEM is a versatile open source natured blockchain platform which came into the crypto scene in January 2014. It is popular for meeting the requirements of the mainstream industry which are known to stretch far ahead in the clean crypto type applications. This incredible financial solution can be entrusted for the varying needs such as for making payments and ensuring settlement in a completely controlled and as well as private environments. NEMs private version is known as Mijin which is popularly used in Japan by 140 plus institutions. · NEM is loved by most of the users for the fact that it has pure and a highly tried and tested application outside of the crypto. It is applicable for real world applications and can be used for settling any asset. · NEM uses harvesting model instead of the conventional mining. Users are tempted to harvest more for the incentive or the reward they get for harvesting. · Transaction fees is the lowest among many of the blockchain cryptocurrencies. · NEM has the potential to verify a transaction just in a matter of little over a couple of minutes. · NEM can be used for a lot more applications other than just the financial and monetary solutions. For example, theoretically, NEM can be used for storing any kind of official documents such as company shares or birth certificates etc. · Proof of work is used by the NEM model which in today’s time is just considered as a total waste of time, computing energy and other monetary resources. · Scalability just like Bitcoin is an issue having a block size fixed at 1MB. · Public or Private — The NEM technology has got the potential to impeccably interface between he private and public network chains. This enables you to transfer files, crypto tokens or currency from your internal private network to another company’s private network using the public blockchain. On the other hand, Tangle majorly is a public network. · Speed — Speed is the best selling point of NEM. NEM is known for completing its transaction successfully in 3 seconds. This is quite low as compared to that of Tangle which is around 3 minutes. Although, 3 minutes for Tangle is still good as compared to several other blockchain based cryptocurrencies. · Transaction Fee — NEM does have a transaction fee to be paid for every transaction carried, along with any additional fee if message is included. The Tangle on the other hand has absolutely no fee for carrying out transactions over its network. · Fork — NEM is an open source project and it’s codebase is available online so that any developer working on NEM project could download, modify and upload the code as per their project’s requirements. On the other end, Tangle is completely closed-end solution with no such flexibility available as compared to NEM or may be other blockchain technologies. · Harvesting — NEM employs the concept of harvesting instead of mining. In this case, approved users only with a certain number of XEM could only harvest. This makes absolutely no room for cheating or a scam to take place. The Tangle on the other end does not require mining for validating transactions, but nonetheless, it is also a secure model for users. Litecoin, under the blockchain umbrella comes as one of the many online currencies of decentralized nature. The currency could be employed for performing online transactions and purchases, including website development, buying subscriptions or ordering things like jewelry online. Just like other blockchain based cryptocurrencies, it provide users with a very easy and quick method for accepting money online. The payment receiver has the potential for quick verification of the transaction made and this Litecoin platform is actually much quicker than Bitcoin and several other blockchain based technologies. · Litecoin in terms of completing a transaction is the fastest among many of the popular blockchain based cryptocurrencies. · The transaction fee in this model is as good as zero as compared to Bitcoin. · Mining is far easier in Litecoin as compared to other cryptocurrencies due to the inclusion of its innovative ‘Prove of Work’ algorithm. · Litecoin has a very low market cap when compared with the other top of the line tokens in the crypto market of today. · Security is impeccable which has grown in quality since its inception some 6 years ago. · Litecoin is touted as a kind of modified version of bitcoin and it lacks innovations of its own. It has got significant identity problem and it gets a kind of over-shadowed in the presence of Bitcoin crypto platform. · Once the scalability issue of Bitcoin is resolved then Litecoin market would definitely be negatively impacted. · Speed — In comparison to the 3 minutes speed of transaction completion for the Tangle platform, the speed for same for the Litecoin is 10 times than the Tangle. Yes, you read that right, transaction speed for Litecoin is 30 minutes. However, Litecoin transaction validation is very quick and is just a matter of seconds. · Transaction feed — As stated above in comparison of multiple other blockchain platforms with Tangle, the later has got no transaction fees at all. In case of Litecoin, there is a transaction fee but that is too little. · Mining — Litecoin like almost all other blockchain based cryptocurrencies rely over the mining mechanism for validating all the transactions carried on through its network. On the other hand, Tangle as mentioned above does not require mining at all. · Market Cap — Litecoin is known to have a market cap which is even lower than that for NEM and ETC, which is required when the volumes are higher. On the other hand, Tangle is fully scalable and does not have any such market cap imposed. As we have learned by now that the Tangle network has got the potential to validate transactions in quick time, which is all thanks to its graph structure. However, it has also been noticed that the current implementations in several crypto projects are seeing another big issue of synchronization. It is the need for the synchronization of the states in the network between the nodes. There are ICOs using such models who have multiple impractical solutions to these issues. Some are having a single node controller mechanism while some using a multi-node (as many as 12 nodes) controller. Such controllers are operated directly by the developer and this does not make it an ideal solution, mainly because of having immense human intervention, leading to many possible human errors. Furthermore, it is also not ideal because of having a single point of failure. Just as we write this, the IOTA, IoT Chain and Byteball are the major players in the crypto market that are categorized as the blockless projects. With the blockchain core cryptocurrencies, the main bottleneck is the limited creation speed. As far as bitcoin is concerned then it is known to generate a new block in every 10 minutes which is too long to manage a highly complex network. Ethereum on the other hand is much better, but still it takes some 20 seconds for the purpose of validating the block. Has anybody ever thought that why at all we need a block? If you understand the bitcoin network then it is seen that numerous transactions carried are actually mined into the form of block. At the same time, the sequence of transaction is recorded by the pre-hashes that exists between the blocks. So, how is that for an idea if we go on to combine the transactions and blocks together? In this situation, every transaction should be made involved directly in the maintenance of the sequences. So, once, any transaction is carried, there is a possibility for the mining process to be skipped. This all shapes up into an efficient, blockless model which will have the best of both the blockchain and Tangle technologies, thus giving us the most optimized and trusted solution. In essence, blockchain is good with its data integrity features and in security and transactions handling features, Tangle has a definite edge over blockchain. At this point of time, it could be concluded that Tangle is better than blockchain, but at the same time, it doesn’t take much away from the credibility of the blockchain as the other is a novice technology and taking its stepping stones towards success. However, it can be safely said that tangle has got great potential for beating blockchain in the near future. Copyright © CyBit Limited 2018. All rights reserved.